During her presentation, “Nurturing and Supporting Your Garden,” luncheon speaker Shameka Brown, Belleville Head Start Center manager, encouraged parents and Head Start/Early Head Start supporters to take better care of themselves, in order to be of good use to the children in their lives. 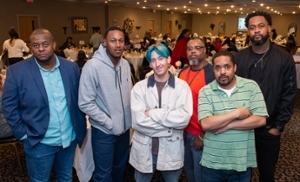 The awards portion of the program included recognition in the five categories of Success Families, Male Involvement, Education/Training, Perfect Attendance and Volunteers. The SIUE Head Start/Early Head Start program serves more than 1,300 families and youth from birth to age five (including children with special needs) in St. Clair County. The program includes 14 early childhood education centers, seven managed directly and seven collaborations. Services include a rigorous school readiness comprehensive program that includes educational programs for family members, and health and dental screenings. 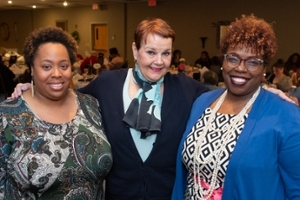 SIUE Head Start/Early Head Start Program Director G. Lynnie Bailey (center), welcomes luncheon speaker and Belleville Head Start Center Manager Shameka Brown (right) and 2019 Illinois Head Start Parent of the Year Lateyka Vaughan (left). (L-R): Michael Thigpen, SIUE Head Start/ Early Head Start family engagement associate and parent; Demetrius Pawnell Sr., Jackie Joyner Kersee Head Start Center parent; George Lemer III, Belleville Head Start Center parent; Tarus Moore, Belleville Head Start Center parent; James Green, Home Based parent; and Anthony Brown, Belleville Head Start parent. 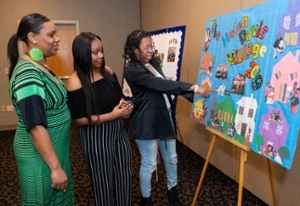 Taking note of the Belleville Head Start Center poster board are (L-R): Katrina Lampley, Cindy Harvey and Sherl Sattlefield, all Jackie Joyner Kersee Head Start Center parents.